Since all of us are not blessed with a naturally flawless skin, here’s how to make a difference by indulging in these healthy bites that prevent acne. Do you envy your friend or colleague with flawless skin? Can’t get rid of acne despite regular beauty and skin treatments? Well, at some point or the other in life, everyone gets victimized by acne, especially those in the age group of 16-25 years. “Hormonal changes within our body are the greatest reason for acne formation. High stress life¬styles, too, promote acne produc¬tion,” says Geetika Mittal Gupta,* dermatologist, International Skin & Anti-Aging Centre. However, acne is just not always caused by stress. Our eating habits also have a role to play “Putting topical packs or ointment to control acne won’t solve the problem. What we eat and our digestive system directly affects the skin,” says Prachi Gupta, fitness expert, Fitho Wellness Services. “Apart from seeking help from a dermatologist who may put you on medicines, if yours is a serious case, you must observe if your acne is aggravated after eating certain foods. Those foods should certainly be avoided,” adds Geetika. Since all of us don’t have naturally-gifted skin, making simple changes to our diet can make a difference. 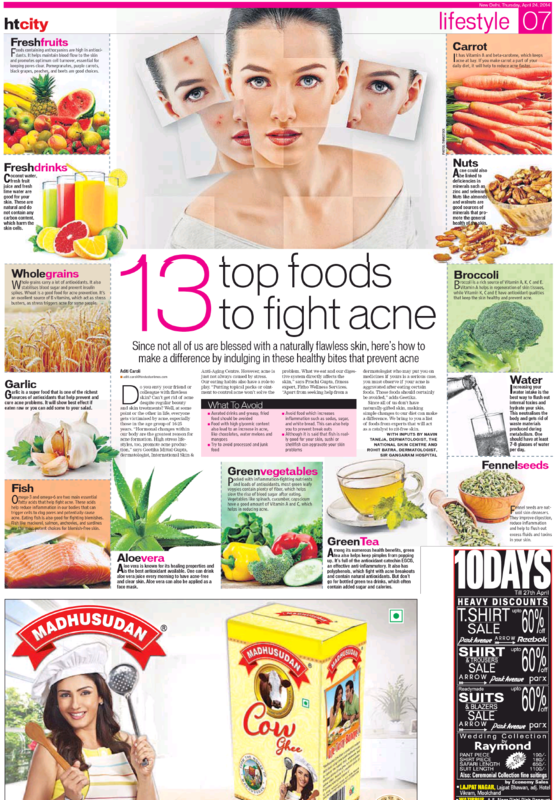 We bring to you a list of foods from experts that will act as a catalyst to zit-free skin. Foods containing anthocyanins are high in antioxidants. It helps maintain blood flow to the skin and promotes optimum cell turnover, essential for keeping pores clear. Pomegranates, purple carrots, black grapes, peaches, and beets are good choices. It has Vitamin A and beta-carotene, which keeps acne at bay. If you make carrot a part of your daily diet, it will help to reduce acne faster. Vitamin A helps in regeneration of skin tissues, while Vitamin K, C and E have antioxidant qualities that keep the skin healthy and prevent acne. The best way to flush out internal toxins and hydrate your skin. This neutralises the body and gets rid of waste materials produced during metabolism. One should have at least 7-8 glasses of water per day. Fennel seeds are nat¬ural skin cleansers. They improve digestion, reduce inflammation and help to flush out excess fluids and toxins in your skin. Tea also helps keep pimples from popping up. It’s full of the antioxidant catechin EGCG, an effective anti-inflammatory. It also has polyphenols, which fight with acne breakouts and contain natural antioxidants. But don’t go for bottled green tea drinks, which often contain added sugar and calories. Packed with inflammation-fighting nutrients and loads of antioxidants, most green leafy veggies contain plenty of fiber, which helps slow the rise of blood sugar after eating. Vegetables like spinach, cucumber, capscicum have a good amount of Vitamin A and C, which helps in reducing acne. Sources of antioxidants that help prevent and cure acne problems. It will show best effect if eaten raw or you can add some to your salad. It is the best antioxidant available. One can drink aloe vera juice every morning to have acne-free and clear skin. Aloe vera can also be applied as a face mask. Fatty acids that help fight acne. These acids help reduce inflammation in our bodies that can trigger the cells to clog pores and potentially cause acne. Eating fish is also good for fighting blemishes. Fish like mackerel, salmon, anchovies, and sardines are the most potent choices for blemish-free skin. Coconut wafer, fresh fruit juice and fresh lime water are good for your skin. These are natural and do not contain any carbon content, which harm the skin cells. Whole grains carry a lot of antioxidants. It also stabilizes blood sugar and prevents insulin spikes. Wheat is a good food for acne prevention. It’s an excellent source of B vitamins, which act as stress busters, as stress triggers acne for some people. Acne could also be linked to 4 deficiencies in minerals such as zinc and seleniurb. Nuts like almonds’ and walnuts are good sources of minerals that pro¬mote the general health of the skin. With Inputs from Rohit Batra, Dermatologist, Sir Ganga Ram Hospital and Navin Taneja, Dermatologist, National Skin Centre.